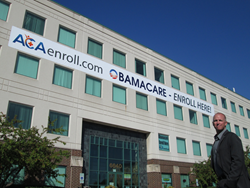 Did you miss the Affordable Care Act Open Enrollment Period? There are other ways to protect yourself and your family from life’s uncertainties until Open Enrollment starts up again on November 15th, 2014. Bill Hallberg, Chief Enrollment Officer, at ACA Marketplace Enrollment Solutions headquarters. Even if you missed Open Enrollment, you can enroll on the Health Insurance Marketplace if you have a qualifying event as long as you choose a plan within 60 days. Some examples of qualifying events include moving to a new area, losing your employer-sponsored coverage, expiration of COBRA benefits, or even significant income changes which affect your subsidy eligibility. If you think you may qualify for a special enrollment period, ACA Marketplace Enrollment Solutions (ACAMES) can help with your application and enrollment in a health plan. Short term major medical coverage may be the option for you if you want to protect yourself from gaps in medical coverage until the next Open Enrollment Period begins on November 15th, 2014. Short term plans usually cover individuals for a limited number of months and are typically not able to be renewed past their termination date. Fixed indemnity benefits provide a set reimbursement amount for each day you are in the hospital and for each day you receive specified medical treatment or surgery. These benefits are paid in specific amounts without regard to the costs of services rendered. For example, you may receive $100 per day you are in the Emergency Room. These can be purchased as stand-alone plans or as a supplement to high deductible health plans. Life is full of unexpected accidents. Did you know that there are insurance plans that can provide coverage specifically for life’s surprising moments? Accident plans usually provide a set amount of coverage for specific incidents, such as a broken arm. Families with children who play sports or participate in other physical activities may benefit from this supplemental plan option. Critical Illness plans typically pay a lump-sum benefit amount when you are diagnosed with a specific illness such as cancer, heart attack, stroke, or kidney failure. This benefit amount can be used to offset expenses not covered by your health insurance plan, such as co-payments or lost income due to illness. This is just a snapshot of the plans that may be available for consumers outside of the open enrollment period. Many people are unaware that there is such a large variety of coverage options available to help them. ACA Marketplace Enrollment Solutions is staffed with knowledgeable agents year-round who can help you supplement your current insurance coverage or find a temporary plan to provide protection until next year’s Open Enrollment Period. Who Is ACA Marketplace Enrollment Solutions? •ACAMES is a licensed, certified and multi-lingual national enrollment firm that specializes in the Health Insurance Marketplace and Senior Products. •ACAMES is not affiliated with any governmental agency. As a Health Insurance Marketplace enrollment provider, we are here to assist individuals and families secure health insurance. ACAMES is compensated by the insurance carrier and there is no cost to the potential customer or enrollee. •ACAMES agents certified on the Marketplace Exchange possess extensive knowledge on the enrollment process. These certified agents will also help calculate subsidies and explain how deductibles, out-of-pocket maximums and copayments work under The Affordable Care Act. •ACAMES represents national and regional health insurance carriers across the country that offer products both on and off the Health Insurance Marketplace, including a variety of ancillary products. Visit our website at http://www.acaenroll.com or call us at (800) 342-0631 to get more information. *These plans do not meet the definition of minimum essential coverage and you may have to pay a fine or penalty if you do not obtain major medical insurance coverage in 2014.